Marvel recently treated us to another piece of previously unseen footage from Avengers: Endgame and we’ve typically been dissecting it since. What we didn’t expect to find was a hidden message quietly dubbed into the audio of the clip that you almost definitely missed the first few times round. In the clip, which sees the remaining Avengers attempting to formulate a plot to take down Thanos, we hear an over-zealous Captain Marvel wanting to take the fight to the Mad Titan immediately. Re-listen for yourself, the voice can be heard around the 0:48 mark, just as Thor stands up. Once you’ve heard it, you can’t un-hear it and it’s got us asking all kinds of questions. Is it a secret message? Could Captain Marvel also add telepathy to her ever-growing list of powers? Could it be absolutely nothing? Is it Laurel or Yanny all over again? It’s not just us that can hear the whisper either, more and more people are picking up on the creepy message. It definitely wouldn’t be unthinkable for Danvers to have telepathic powers – though that would only add to the question marks surrounding her late joining of the Avengers. 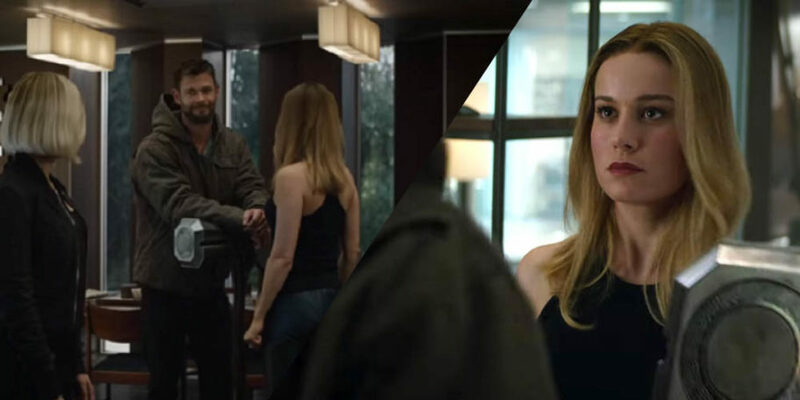 Marvel Studios boss Kevin Feige has attempted to clear up any confusion on why Nick Fury didn’t page her sooner, suggesting it may not be as clear-cut as we all first thought. “Well, I’d say two things. One, she does say it’s gotta be a real emergency, right?” said Feige, which is a pretty unusual answer given the dire situation that unfolds throughout Infinity War.